The People's Guide 2015 40 Effective 4/1/14-3/31/15 The Affordable Health Care Act (also called Obamacare) is a law that allows many more people to get health insurance that they can afford. Some of the features of that law that can help you and your fam- ily are already in place. The Affordable Health Care Act: • Prohibits insurers from denying insur- ance to anyone with serious illnesses, including pre-existing conditions such as asthma and diabetes • Provides free preventative services, including immunizations • Prevents insurance companies from imposing lifetime dollar limits. In the past, people with cancer or other serious illnesses in their childhood could run out of coverage later in life. • Allows young adults to be covered through their parents' insurance until the age of 26. If you feel like you are still being denied coverage, call one of the agencies listed in Good Advice (pg. 68.) Your Health Care Rights There are also new services in the law that will help women and children including: • Diabetes screening for pregnant women • Breastfeeding support, supplies, and counseling, and • Domestic violence screening and coun- seling The law makes changes in the Medi-Cal program that allow many more people to participate. In the past these people would have had very limited health coverage. 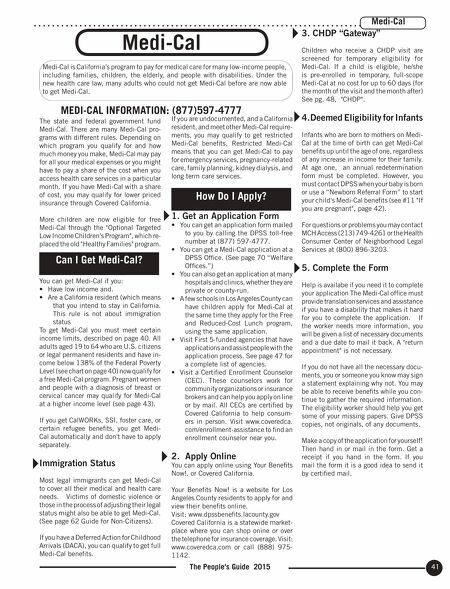 • If you are very low income and between 19 and 65 years old with no children you may now qualify for Medi-Cal. • If you are working but do not receive health care from your employer, you can sign up for a health care program through Covered California. That is the name for the "exchange" which is a group of insur- ance companies who can offer you health coverage. You can select which company to get insurance from and you will have a chance to compare their rates. The website is www.coveredca.com. You can check it to either choose a private insurance program or even apply for Medi-Cal. 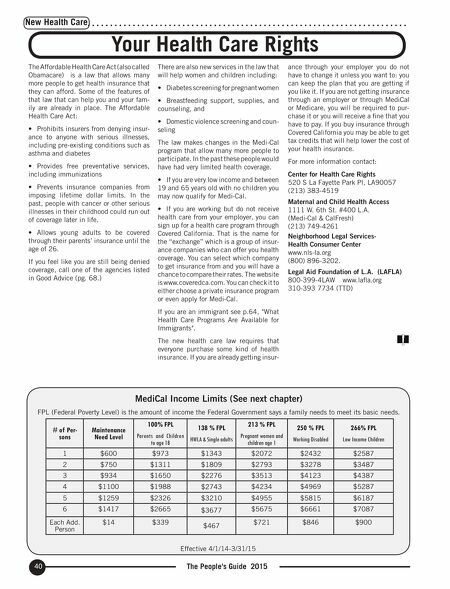 If you are an immigrant see p.64, "What Health Care Programs Are Available for Immigrants". The new health care law requires that everyone purchase some kind of health insurance. If you are already getting insur- ance through your employer you do not have to change it unless you want to: you can keep the plan that you are getting if you like it. If you are not getting insurance through an employer or through MediCal or Medicare, you will be required to pur- chase it or you will receive a fine that you have to pay. If you buy insurance through Covered California you may be able to get tax credits that will help lower the cost of your health insurance. For more information contact: Center for Health Care Rights 520 S La Fayette Park Pl, LA90057 (213) 383-4519 Maternal and Child Health Access 1111 W. 6th St. #400 L.A. (Medi-Cal & CalFresh) (213) 749-4261 Neighborhood Legal Services- Health Consumer Center www.nls-la.org (800) 896-3202. Legal Aid Foundation of L.A. (LAFLA) 800-399-4LAW www.lafla.org 310-393 7734 (TTD) New Health Care # of Per- sons Maintenance Need Level 100% FPL Parents and Children to age 18 138 % FPL HWLA & Single adults 213 % FPL Pregnant women and children age 1 250 % FPL Working Disabled 266% FPL Low Income Children 1 $600 $973 $1343 $2072 $2432 $2587 2 $750 $1311 $1809 $2793 $3278 $3487 3 $934 $1650 $2276 $3513 $4123 $4387 4 $1100 $1988 $2743 $4234 $4969 $5287 5 $1259 $2326 $3210 $4955 $5815 $6187 6 $1417 $2665 $3677 $5675 $6661 $7087 Each Add. Person $14 $339 $467 $721 $846 $900 MediCal Income Limits (See next chapter) FPL (Federal Poverty Level) is the amount of income the Federal Government says a family needs to meet its basic needs.